As mentioned in the last post about the sound of Metallica's new record thanks to over-compression (hypercompression as some mastering engineer's call it), it's important to know how and why the process started. 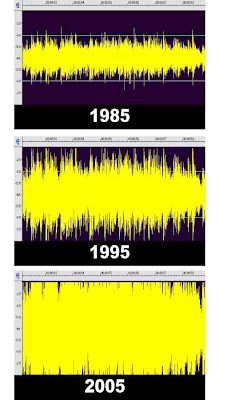 The loudness wars have been going on since pop radio began in the 50's. If a record sounded louder than the one that just played over the airwaves, many listeners would perceive it as "better", so the labels were always trying to make their records louder as a result. Since the music delivery method at the time was a vinyl record, there was a built-in physical limitation to just how loud you could ultimately make it. Make it too loud and the stylus would rattle right out of the grooves and the consumer would ask for his money back, so hypercompression never became an issue during this period. This physical limitation to level essentially went away with the introduction of the CD in the 1982, but the level war broke out again in an unforeseen way. There used to be a weekly compilation of singles from all the major labels that was sent to radio program directors in the 80's. When a label heard one of their songs that sounded quieter next to another on the compilation, they would freak out and demand that the mastering engineer on the next record pump up the level so it was at least equal to the loudest track on the CD. As a result, a loudness war broke out to an even greater degree than it was with radio. Just to see how we've come to this commonplace hypercompressed era, take a look at some graphic excerpts from my book "The Mastering Engineer's Handbook" that illustrate this perfectly. Here are waveforms from a typical hit record from 1985, 1995 and 2005. Notice that the '85 waveform is not too loud and there's plenty of peaks and valleys indicating a fair amount of dynamics. The '95 waveform is a lot louder but still has some dynamics to it. The 2005 version is starting to look like a square wave, with hardly any dynamics. And as we approach 2009, it's even worse and looks just like a solid block. It's become quite an art to make something like this sound even remotely good. Be cautious when pumping up the level on your songs as it comes with a price. You may make it louder but studies by broadcasters have shown that the listener generally hates the hypercompressed sound and won't listen for long! There's a furor happening over the sound of Metallica's new album that just might have a chance to change a trend that's been inadvertently hurting the music business for the last 20 years. Death Magnetic is so compressed that fans have started a petition to have the album remixed. The over-compression ("hypercompression" as mastering engineers call it) probably wouldn't have been an issue except for the fact that the version in Guitar Hero sounded so much better, albeit 10dB lower in level. With a less compressed and much more pleasing version to compare to the official release, fans feel ripped off since the CD sounds so bad in in a side by side comparison. In the next post we'll look into the origins of hypercomression complete with examples. Recently there's been a national discussion for lowering the drinking age from 21 to 18, and several states, including Florida, Wisconsin, Vermont and Missouri, are actively studying the prospect. The chief argument is that if you can fight for your country and you can vote for president if you're 18, you should be able to drink a beer legally too. But lowering the drinking age would be a boon to the music industry and, I dare-say, even provide the engine for turning it around. A little history. We went through this same issue once before when the drinking age was a variety of ages from 18 to 21 across the states, but the war in Viet Nam brought about the "If I can fight for my country, I should be able to drink" argument that we're seeing again today. By 1972 most states agreed that voting = legal alcohol and lowered the drinking age to 18, which opened the floodgates to accommodate a whole new set of thirsty patrons, and the way to get them in the door was to provide live entertainment. Clubs sprang up everywhere and live music thrived. If you were a half-decent band, you could easily find somewhere to play almost every night of the week and get paid for it too (none of this "pay-to-play" crap existed). This was great for the music business because it gave neophyte musicians a place to get it together both musically and performance-wise. Just like The Beatles did in Hamburg in 1962, you could play 5 sets a night 5 nights a week to really get your chops together. Do that for a year or two and you were ready to take the next step towards doing your own thing, if that's what you wanted to do. Unfortunately, it was also easy to fall into the trap of just playing clubs forever because the money was so good, but those with ambition took their club days for what they were and moved on up. They had learned what they needed to by constantly playing in front of crowds. This musical support infrastructure is largely gone these days. A band that is considered to be playing a lot today is lucky if they play once a week. That means it will take a group a lot longer to not only get to the point where they're comfortable in front of crowds, but to get musically and vocally tight as well. The longer it takes a band to make progress, the more likely they will break up or change their direction, which means that perhaps the next great trend in music has shriveled on the vine. Since the drinking age was raised to 21 in 1982, the excitement and diversity in music has steadily decreased. It's bland, it's homogenized, and we've really not seen a new trend that's caught on big since Rap (which hit the mainstream 25 years ago). I attribute this mostly to the large scale closing of the club scene due to the higher drinking age (the tougher DUI laws too). Higher drinking age and more arrests = fewer club patrons. Fewer club patrons = goodbye clubs. Let's face it - musicians need the constant feedback and attention that only an audience can bring. The more you play live, the better you get at it, which leads to more experimenting, which means the more likely you are to find your own voice. I hope the drinking age is lowered soon. Music (and the music industry) desperately needs a shot in the arm. 1. If you can fight and die for your country, you should be able to drink at 18. 2. If you are trusted to vote at 18, you should be able to have a drink at 18. 3. 18 year olds are already drinking anyway. Just go to any college campus and see for yourself. 4. A lower drinking age means more clubs, which means more work for musicians. 5. More work for musicians means better entertainers, better musicians, more interesting music, and ultimately a stronger music industry. Keeping up with the theme of my last post, some years ago I was privileged to get a chance to play with the multitrack of Fleetwood Mac's gigantic 70's hit Dreams. Unlike Long Train Runnin' (as mentioned in the last post) and most other hits from that era, the tracks were pristine, with clearly a lot of time, thought and effort put into them. Like most hits, the tracks just mixed themselves because the arrangement and sounds were so complimentary, but what stood out to me most was the groove. Every single track just felt so good. I remember soloing the hi-hat track (which was surprisingly isolated) and marveling how just the hat alone sounded like a hit. No other instruments, no bleed from other tracks, just pure hi-hat with a groove that had hit written all over it. I don't know that's ever happened to me before or since, at least in regards to a hi-hat track. Which also plays into the theme of my last post. Today we strive for recording and musical perfection at the expense of the groove, but if a track doesn't feel good, nothing else matters. I went to a demo of the new SSL Matrix the other day and they were using the tracks from the old Doobie Bros. hit Long Train Runnin' as demo material. I've always been a big fan of the Doobies, especially of their vocals, so I was intrigued about how they were layered and asked to have them soloed. Much to my surprise, the vocals weren't layered, doubled or even treated except for printed reverb - just pure 3 part harmony (two parts above the lead vocal). What I especially loved was how imperfect they were, with the highest voice straining to hit the notes, coughing and throat clearing in between phrases, and even a little talking on the track. How refreshing! Nowadays we make everything perfect because we can, more often then not to the detriment of the music. Way back when the technology wasn't nearly as advanced as the lowliest DAW in the typical bedroom, perfection didn't matter, but feel and groove did. There were lots of mistakes left on tape, both musical and technical, but they added to the character of the music. Today we get rid of the character as a matter of good production policy, yet the songs from that era endure and our modern more perfect ones don't. The lesson here is that no matter what, a hit is still "in the grooves" (to use an old term relating to vinyl records). A hit song with imperfections is still a hit, while no matter how perfect a mediocre track might be, a hit it's not.